I am a most fortunate knitter in that a good internet friend Junie parted with her Virtual Yarns kit for the Autumn Oregon cardigan. She felt it was too far back in her knitting queue to ever get to and sold it to me. Thanks again Junie! I wonder if I can force myself not to start this sweater until the KnitALong for it starts in January? Ha! The colors are truly amazing with tiny twists of complementary colors inside each skein. The yarn also feels a tiny bit thicker than the Jamieson&Smith I've been using for fair isles. Patience woman! Get through the holidays and then sit by your fireplace and knit those blizzards away. 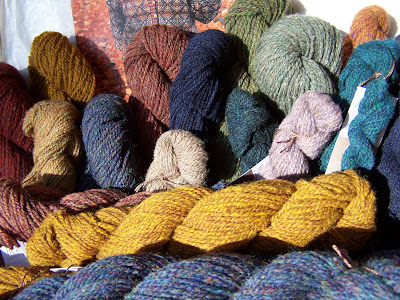 I know you will enjoy knitting with the Hebridean yarn. It is lovely stuff. I was pleased to see it go to a friend who happens to be one of the finest/fastest hand knitters I know. These colours and textures are indeed inspiring. Congratulations, Anne, it will look maahvellous. And BTW the Hemsdale is stunning, DD is a lucky girl. Do it! Do it now! I want to take those skeins and run my fingers thru the yarn and smell the wooliness. Lucky, lucky you!